Cette visite vous fait gagner des heures de recherche en vous amenant à une liste des principaux sites touristiques du Caire. Visitez le palais Abdeen, le monument au soldat inconnu, la rue Al-Moez, le parc Al Azhar et le café El Fishawi. Voyagez entre des sites dispersés dans un véhicule confortable et appréciez le fait que l’enlèvement et le ramassage à l’hôtel soient inclus. Un des points forts de la visite est de savourer un délicieux dîner au restaurant Studio Masr, qui offre une vue panoramique sur la ville. 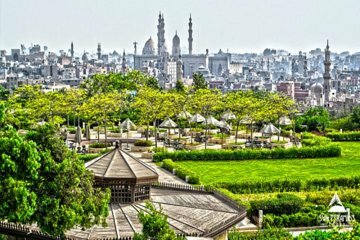 Découvrez l’un des plus grands et des plus beaux jardins du Caire, le parc Al Azhar. I booked the following tour through Viaor for my family (four people) ;" Overview Cairo by Night Tour visiting Abdeen Palace, The Monument to the Unknown Soldier, Al-Fishawi Cafe and Al-Moez Street. Dinner at the end of the tour in the most beautiful restaurant Studio Masr in El Azhar Park of the most beautiful gardens in Cairo in terms of trees and the area and the view overlooking the garden and some Islamic monuments". The company was Sun Pyramids Tour. An unpleasant woman on the phone told me that this tour has never existed and that I was making it up. She wanted us to walk through the old town as do all the tour companies but as it wasn't what I had paid for I got really angry and Yasser, the guide, took on him to help us and ignore her shouted instructions. He is a very learned ,interesting and caring guide. He did his very best and gave us a fantastic lesson of history in the car while heading to the Unknown Soldier's Monument where Sadat was shot and buried, then taking us into the Hanging Church in Coptic Cairo which was absolutely stunning; We later arrived at the restaurant in El Azhar Park. It is really beautiful, with a breathtaking view, all the way to the Citadel and old Cairo, over stone basins, stairs and palm trees but the food was a real joke ; pitta and hommos type of little dishes followed by a plate with a few chunky chips,and plain white rice 2,barbecued chicken pièces with herbs, 2 little barbecued mutton sausages and a little bowl of rice pudding for dessert. Same food as at any basic place in town. I paid for the glass of fruit juice plus taxes and we were driven back to our hotel by our cool driver Zacharia and our very friendly guide, learning more interesting historical facts all the way back. We will never visit the beautiful Abdeen palace but Choukran Yasser! You really saved our last evening in Cairo !